In this also beautiful VIS image, taken by the NASA - Mars Odyssey Orbiter on November, 17th, 2009, and during its 35.161st orbit around the Red Planet, we can see a small - and flat - portion of the Martian Region known as Terra Sirenum. Terra Sirenum is a large Region located in the Southern Hemisphere of Mars. Please notice the dark, large, extremely ancient and truly flat Unnamed Impact Crater (possibly an "Exhumed" one) that is visibile at the upper left (Sx) of the frame. Terra Sirenum is centered at about 39��42�' South Latitude and 150��00' W﻿est Longitude and it covers (roughly) 3900 Km (such as about 2421,9 miles) at its broadest extent. 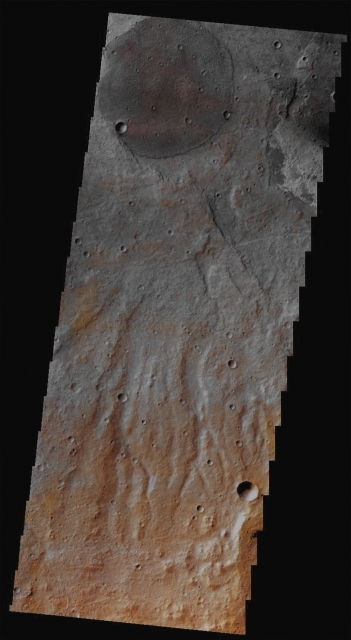 This Martian Region is - mostly - an Upland Area notable for massive cratering, including the large Newton Crater; it is found in between the Phaethontis Quadrangle and the Memnonia Quadrangle of Mars. However, a (relatively small) Low Area of Terra Sirenum is believed to have once held a Lake that, eventually, drained through Ma'adim Vallis. This image (which is an Original Mars Odyssey Orbiter falsely colored and Map-Projected frame published on the NASA - Planetary Photojournal with the ID n. PIA 20427) has been additionally processed, magnified to aid the visibility of the details, contrast enhanced and sharpened, Gamma corrected and then re-colorized in Absolute Natural Colors (such as the colors that a normal human eye would actually perceive if someone were onboard the NASA - Mars Odyssey Orbiter and then looked down, towards the Surface of Mars), by using an original technique created - and, in time, dramatically improved - by the Lunar Explorer Italia Team.